Now I am writing this Aspire Plato review, made possible by the product provided by the fantastic staff of Aspen Valley Vapes. It's currently going for $59.99 at time of writing You can get it here. Buy for $44.99 - Ships from China. Buy for $49.99 - Ships from USA. The Aspire Plato I received is the "Grey" finish. It's a matte, dark grey, brushed finish that looks really nice, has great texture for gripping, and overall feels pretty good in my fingers. The screen is pretty small, and comes with a screen protector over it to keep it safe during shipping. The "All In One" concept is great, put the tank, battery, and everything except the drip tip inside the mod, and everything you need is in one small package. The overall implementation is ... well read on to find out. Suffice it to say for the moment that this small mod feels like it would be good for a brand new vaper or anyone wanting a stealth vape. I could not find the traditional specifications chart on Aspire's website, so the list below is a compilation of specs based purely on what can be pulled from Aspire's advertising. Upon picking it up, the first thing I noticed is that the battery door shifts around a lot. It is reminiscent of the battery door from my D2. 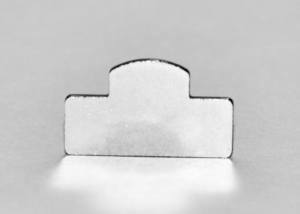 It is a "U" shaped design that slides onto the mod, but unlike the D2 it's held in place by magnets instead of friction. This is somewhat problematic though, as it is not a snug fit, which is what causes the door to shift so easily. In the middle of the back edge of the "U" shaped door is a small slit, which is supposed to be for checking the level of the juice in the tank behind it. In reality, the slit is too small to be useful, and it is just as easy to pull the sloppy door off to view the juice level in the tank itself. The fire button is a silver metal disk. While it doesn't rattle, it does spin freely beneath my finger, making a really annoying "metal on metal" sound. For me, that is almost (but not quite) as bad as battery rattle. I would have preferred to see the button fixed in place rather than rotating, but that's just a preference thing. Below the fire button is the small display. It is usable enough, with a battery indicator, the working voltage (when you hit the fire button), the ohm value of your coil, and the wattage setting. The coolest thing is that it is designed for left AND right handed vapers, no matter which way you hold the mod, the display has a sensor that will cause it to flip to be right side up when you are looking at it. Underneath the display is where you will find the Up and Down adjustment buttons. In Aspire's version, these are combined into a single "bar" style setup. I am not a huge fan of this style, and worst of all, they are reversed from the more traditional layout with the Up button on the left and the Down button on the right. I've been vaping long enough that this really just felt wrong, and was very difficult to get used to. Removing the battery door reveals the battery tray and the tank setup. The tank assembly's all in one design is one of the Plato's best features, but also one of the biggest failures. The entire assembly is held together with the coil assembly. However; when you remove the coil, the entire thing falls apart in your hands. If you aren't careful the glass tank could easily fall to the ground and shatter. 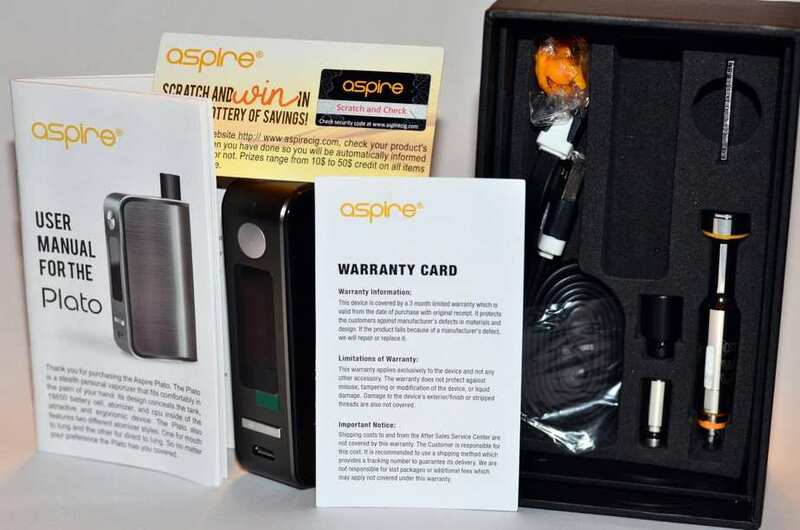 Aspire did not think this through, and failed to include a spare tank in the package. Thankfully, when mine hit the floor the first time, it did not break, otherwise this would have been a very short review. The base of the tank goes all the way through to the bottom of the mod, so that if there happens to be a leak, it will (theoretically) leak straight down through the airflow adjuster mounted on the bottom of the mod. I did have one pretty serious incident of leaking, I filled the tank, vaped for a bit, laid the mod down, and when I picked it back up, juice was coming out the side of the battery door. With the all in one design, it was a real pain to clean up as I had difficulty getting a cloth in behind the tank to wipe down the mod. It would have been better if the tank were empty, as I would have just taken it all apart, but with juice in it, that is not feasible. Had I set the mod down on it's base, standing upright, it probably would have leaked out the bottom as designed. The base of the tank also doubles as the small dial for adjusting the airflow. When you install the battery in the Aspire Plato, it goes through an initialization sequence that allows you to select between Temperature Control mode and Power mode. If you select Temperature Control, then you are offered a choice of Nickel (NI), or Titanium (TI). There is no option to adjust the TCR of any of the preset coil modes, nor are there any manual TCR modes. If you select Power mode, then the options are for Bypass mode or Regulated mode. Selecting Bypass mode turns the Plato into a mechanical style mod and delivers the full power of the battery when you hit the fire button. Selecting Regulated Mode makes the Plato adjustable from 1 to 50 watts. The problem with this initialization sequence design is that it happens every time you take the battery out and put it back in. Worse, if you select the wrong mode at first, the only way to go back is to take the battery out and go through it all again. There is no way to change modes once a mode has been selected. It would be nice if there was a way to store the initialization settings and change them at will, without going through the full sequence every time. The tank itself seems to be an overly complex design. The entire assembly is held together purely by the pressure of the installed coils. If you fail to properly tighten down the coils, the Plato will leak out of the seals, but if you tighten them too much, you run the risk of pressure breaking the glass tank section. Filling the tank is pretty easy. When you remove the battery door to reveal the tank, you will see 2 orange caps. One is at the top of the assembly and the other is at the bottom. Simply remove one or the other and insert the tip of your dropper or needle bottle into the hole and fill. Changing coils, however, is a real pain if there is juice in the tank. The juice needs to be drained first, and in order to do that, you need to open both of the caps and pour the juice out through the top hole. Once the tank is empty, then you can use the special tool provided to unscrew the coil from the tank assembly. Simply unscrew it until it is loose, then lift it straight up and out of the tank. Just be careful not to drop the glass tank in the process. If you happen to lose the special tool, you can use a dime instead. Personally, I think the design is over engineered and too complex to be worth the trouble, especially for a brand new vaper. The Aspire Plato comes with a 1.8 ohm Nautilus coil pre-installed. As expected, if you have ever used a Nautilus tank, the flavor from the coil is pretty good. It's good enough that the design is still very popular, years after it's original release. 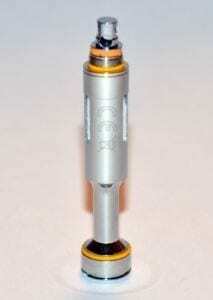 In fact, the coil is still very popular to this day amongst vapers that like Mouth To Lung (MTL) style vaping. The other coil for the Plato is a new proprietary .4 ohm Clapton coil design. This coil design strays very far afield from almost any other coil design I've seen to date. It is a single unit that runs the entire length of the tank and has the top of the tank, chimney and coil all in a single unit. On the one hand, it works pretty well and produces better flavor and much more vapor than the Nautilus coil. On the other hand, it is a proprietary design, and at the time of this writing, there isn't anything other than the Clapton coil available. You can get them at Aspen Valley here for $4.95 each, and even cheaper if you are a member of their "Peak Program". This leads to the most crucial of Aspire Plato problems -- the temperature control mode. As of right now, Aspire does not produce a temperature control coil suitable for use with the Plato. They do not make NI/TI Nautilus coils, nor at present do they offer any temperature control coils in the new proprietary design. Aspire also does not offer an RBA head for the Plato, so you are stuck with only what they offer in their current coil selection. It seems like Aspire is not sure what market they are targeting with the Plato kit. 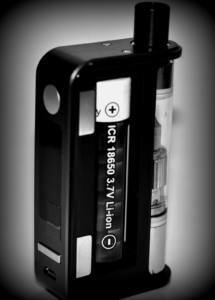 The mod itself seems to be advanced enough for everyone from the new vaper to the advanced user. However, there are some serious issues with this for any target market. Let's break this down into two categories, the new vaper and the intermediate/advanced vaper. For beginners, I think the Kanger Evod 2 is a better option. If you've read this far, then you very likely have the same question I do, why does this mod even have temperature control? I can only speculate that Aspire will eventually expand into making coils with temperature control capable wires, but until this happens, the feature is purely marketing fodder, at least as far as Aspire's concerned. There are a few aftermarket NI and TI coils that I was able to locate online, however, since I don't have any and didn't order some, I was unable to test this feature of the mod. If you can overlook the issues I've already noted, then the Aspire Plato performs well enough with the Nautilus coils to be a decent starter kit for a new vaper, with a little bit of room to grow into the sub ohm coils. It's fairly consistent, at least for a nicotine delivery system, decent enough to be a viable alternative to smoking. With the 1.8 ohm mouth to lung coils, the mod doesn't produce huge clouds, but the flavor isn't too bad. Switching over to the sub ohm setup does improve the vapor a bit, the .4 ohm coil definitely helps in the vapor production department. Unfortunately it seems to change the flavor a bit. If you are not a heavy vaper, then the 2500mah battery should last a fair amount of time, especially with the 1.8 ohm coil and less than 20 watts, but I do recommend picking up some spares. If you need a recommendation, the LG HG2s or the LG HE4s are very suitable options. The Plato Performs well enough for a starter kit, consistent enough to be a viable option to smoking. 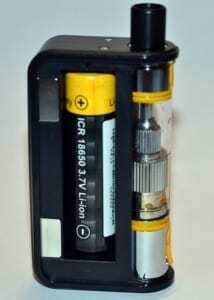 For intermediate/advanced vapers, This is probably not the right mod. Okay, so there is a firmware update available that fixes some of the problems, but reduces the capabilities, kind of. Updating the Plato was not a simple task, it took me multiple attempts to get the computer to actually recognize the mod so that I could update the firmware. Once updated, I went through the familiar initialization sequence and immediately noticed that the TC mode ONLY has NI now, TI is gone. I further discovered that Aspire has also removed the ByPass mode, replacing it with a variable voltage setting. This is the first firmware I've seen that actually changes the way a mod works as well as reducing it's capabilities rather than increasing them. On the plus side, I no longer have to go through the full sequence when putting the battery back in. The updated firmware now stores the last used settings and simply asks if it is a new atomizer, if you say no, all your previous settings are still there, and you are ready to vape. Ultimately, removing a non usable "feature" really isn't a loss, it is simply perplexing. 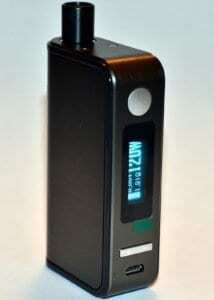 The Aspire Plato might not be bad as a starter kit for new vapers, if it weren't for all the complexities. The tank assembly is overly complex to be included in a starter kit, and the mod is too proprietary to use any other tank. There are too many unusable features built into the Plato for it to be a great starter kit, some even seem to be there just for the sake of having features. The fact that you have to setup the mod every time you take the battery out is abysmal, and will do nothing more than really upset all but the newest vapers that don't know any different. If you can update it, this issue goes away, but good luck with the upgrade process. 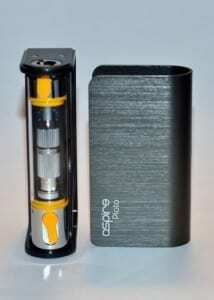 With a maximum capability of 50 watts, the Aspire Plato is definitely not the right mod for a cloud chaser. Without any temperature control coils, it is also not the right mod for a growing cross section of the vaping community. In the end, it really is only good for a small subset of vapers, those that are looking for a small, pocket friendly device that doesn't do much more than deliver nicotine. The biggest saving grace for the Aspire Plato is that Nautilus coils are readily available, but at 1.8 ohms, no more than 15 watts MAX are really necessary, 50 watts is overkill for them. Construction is lightweight, and the all in one design is convenient, to a point. The movement of the battery door is inexcusable. This has been a problem across the industry for as long as I have been vaping, it is really annoying that mod producers just don't get it and continue to release mods with issues that are easily corrected with an ever so slightly modified door. 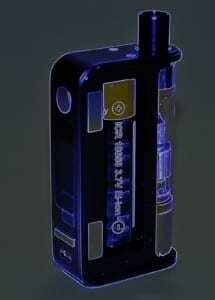 The lack of temperature control coils is astounding, given that they released the mod with the ability to use them. I do wonder what Aspire's long term plan for this mod is, will they continue to develop coils for it, or is the removal of TI and Bypass modes from the settings a sign that they have written it off? Only time will tell what happens with this mod. There are many Aspire Plato reviews that disagree with my assessment. 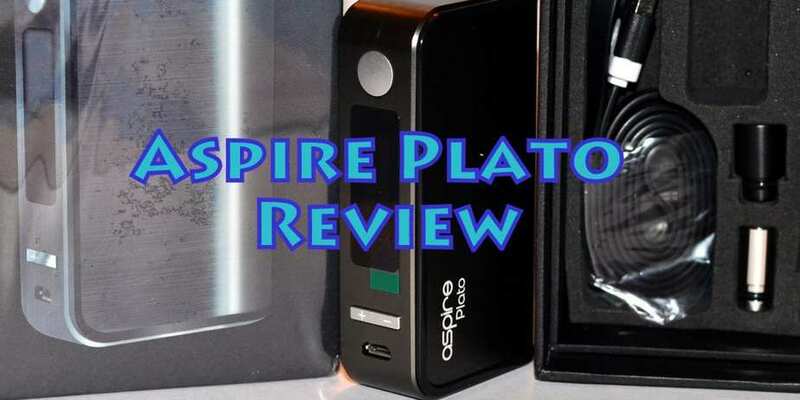 Here's a video review that has a different, more positive, overall review of the Aspire Plato Start Kit. It's up to you, dear vaper, to draw your own conclusions. Want more ? Visit our best vape starter kits page here. I’ve never read a more nit-picky review than this one. I feel the reviewer doesn’t really care for this mod and feels a need to kvetch about every tiny thing he can think of, only to leave me with the impression that, though I feel this is a great mod that I’ve long been waiting for, he wants others to think it isn’t. When does clicking a few times when changing a battery make someone angry? (maybe makes him angry). A lot of other mods do this, and I think this is a good feature. I can’t get my fire buttons to spin and the clickiness is fine (I own 4 of these mods). No problem with the doors, no leaking, updates and logo customizations work fine, no problems with this mod for me. As for the +/- buttons: who really cares that much for this to be a deal breaker or major annoyance? I think Aspire hits it out of the ballpark with this mod, given what comes in the box, I’d say you get more than you paid for! So it has temp control! What’s wrong with the mod having this feature in place for future use? To me, this mod is a marvel of engineering. It’s not advertised as a “cloud chaser”, though it puts out a lot of vapor with the .4 ohm coil. It’s designed basically for the mouth to lung vaper, like me. I do chase clouds with my other mods, but MTL is my main vape, especially if you use high nic tobacco flavored juice. 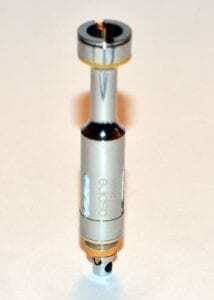 Also, he fails to mention in his “in the box list” that it also comes with a 1.8 ohm Nautilus BVC coil assembly (for MTL). And, with this coil it holds a lot of juice (5.6 ml), you can vape a lot longer between refills! In conclusion of his conclusion: take his nits with a big grain of salt and get this mod for the reasons I stated here. Peace out and keep on vapin’. I haven’t had any problems with my battery door, it fits nice and snug, I can hold onto the mod by just the battery door and it won’t come off, you have to pull it off. Idk how you can say there is no tc coils because you can use all the triton mini coils in the Plato which I do. I love the .15 ni200 coil and the 1.8 Clapton coil but I think I get the best of both worlds with the 1.2 coil and I think it lasts a few days longer than the 1.8. As far as the tank goes it is a little different and takes some getting used to but i think they did a great job with it being an AIO device. It did leak the very first time I filled it up but that was because I didn’t check to make sure the coil was screwed all the way down, after I did that it’s been 4 months and no problems since. I work in a warehouse and it is perfect for stealth vaping but has great flavor and clouds if you want. Also I have dropped it atleast 100 times on the concrete floor and haven’t broken anything. I thought for sure the first time I dropped it the tank and screen would be shattered but to my surprise it wasn’t. I just feel like the person who wrote this review either just got a dud or is purpos lay trying to make it sound bad. Lik the things he’s saying are cons I don’t have any problems with so idk what he’s talking about. I just don’t want someone to be steered away from a good AIO just because someone was having a bad day. I agree with the comments above, the Plato is great for beginners and anybody else. Any mod you buy takes some reading up on and getting to grips with and the Plato is a great compact all in one. This was my first ever mod when giving up the cigarettes 6 months ago and it worked! I have always used the nautilus coils for mtl and they are great. in the last few weeks I have bought another 3 plato’s in different colours as back up for future as the UK TPD laws kick in shortly and these wont be available. I love the fact they have such a high juice capacity and is more than enough for a night out without the need to carry extra juice for re filling. Also the battery for me lasts almost a day, I only vape the nautilus coils at 11.5 watts so this works out great. I have other aspire mods like the pegasus with the triton 1 tank, the mini quest/odyssey with triton mini tank, the pockex and also this week just bought a triton 2 tank. I love aspire, I think they have done a great job, and their products are safe, reasonably priced and coils are easy to get, I mean I bought an Artery Summa aio recently but already I can see that the coils are going to be difficult to get hold of which brings me back to Aspire. I would recommend the Plato to a beginner, read the manual, watch vids on youtube and you will be fine, it is an easy device and with the right ejuice you will love to vape on it. I use the Charlie Chalk liquid which to date I am loving, espeically the wonder worm! Vaping is far superior to smoking and anybody who decides to give it a try will have a good chance of succeeding using the Plato and mtl nautilus coil. Always read lots of reviews and be as informed as you can be to get a balanced view of mods as one persons word or experience is not neccesarily anothers!